You can now control your Kessler dolly with the eMotimo TB3 black. That way you can create a 3-axis motion control kit that is controlled with the TB3 pan and tilt head. Learn how to use the eMotimo TB3 with motorized Kessler dollies in this video tutorial. We will walk you through the mechanical setup as well as how to program your TB3 with this dolly. Setup 3-axis shots in just minutes! If you already have a motorized setup from Kessler you are set. Our Stepper Motor Pod is a drop in replacement. 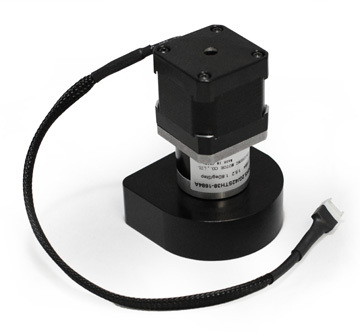 If you only have a manual hand crank system, you will need to pick up a motor mounting plate from Kessler. These are specific to the type of dolly that you own. On these dolly systems, the motor can mount either on the carriage itself or on one of the dolly ends. At this point in time, if your motor mounts to the carriage itself, our Motor Pod will work for you. If your motor mounts on the end, you will need longer cabling to run the length of your dolly. Please contat us if you need longer cabling. There will be longer cabling as an option.